The biggest commodities at Clive these days are handsome new homes and dozens of school children. Half a century ago when Mrs. Scennia Swanson, 82, came to Clive from Knoxville, major commodities were cherries, other fruit, vegetables, grain and coal. There wasn’t a car in town, but both passenger and freight trains clattered by on the Milwaukee railroad tracks at a rate of one every half hour. Now there are perhaps three trains a day. Fifty years ago, a one-room school house provided ample space for youngsters from the dozen homes located in Clive and for youngsters from the coal mining community down the road near what is now 73rd Street and University Avenue. Today the school-age population is increasing so rapidly the modern new school building with space for more than 660 children isn’t big enough. School officials are thinking of building the first wing of a new building. Since 1912, Mrs. Swanson has lived in the same house (NW 86th Street and University Boulevard). Her husband died that year after having typhoid fever. Mrs. Swanson was left with five small children. Friends and neighbors helped her devise a way to support her family. The solution was a large frame building with a general store downstairs and living quarters upstairs. She also qualified to operate the town’s post office. During lulls in business, Mrs. Swanson cooked, made all of the youngsters’ clothes and canned fruit and vegetables. 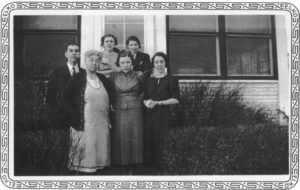 She operated the store & post office for 21 years — until the five children had completed high school (Post Office until 1929). All five graduated from East High School in Des Moines. When the three oldest children were in school, Roosevelt High hadn’t been built. Closest transportation to East High was the streetcar. It made a turn around at 49th Street and University Avenue. The children walked 3 miles just to get to a street car, unless they were lucky enough to hitch a ride. After the children graduated from high school and obtain jobs in Des Moines, they persuaded their mother to give up the store and post office. 1940’s picture of the Swanson Family. The Swanson House was built in 1911 for the purpose of income and living quarters for Mrs. Scennia Swanson and her five small children. Mrs. Scennia Swanson ran the store from 1911 to 1929. At that time it was turned into a two-story house where Scennia and Mildred lived out the rest of their lives. 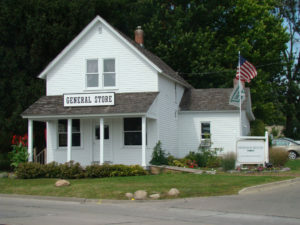 » CHS restores home as General Store & Post Office. Upon Mildred’s death in 1991, she left the property in trust to the City of Clive with the stipulation that it be developed into a park. The city had no desire to work with the structure (house) and came to the historical society to see if they would want to restore the house to some functional capacity and manage it. For the Historical Society, it was a blessing in disguise. No one would wish for Mildred’s death, but with this property, a plan was devised for allowing the old depot to be moved across the street instead of to the new Campbell Park and a promise was make to restore the house to the original General Store. Restoring the Swanson house back to the General Store cost approximately $45,000. The addition had to be removed and replaced, the interior was gutted to remove walls that had been added, floors had to be replaced that had been destroyed by termites. When our contractor removed the 13 layers of wall paper in the main rooms he could see exactly where the shelves had been in the store, so he built the shelves to match the original ones.